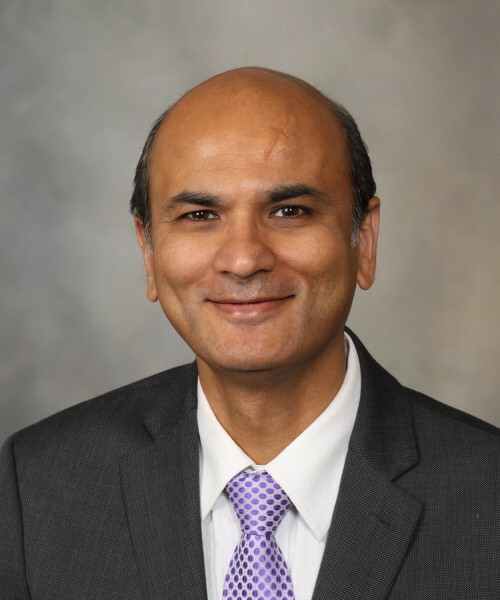 Manish Gandhi, M.D., is a pathologist in Transfusion Medicine in the Department of Laboratory Medicine and Pathology at Mayo Clinic in Rochester, Minnesota. He holds the academic rank of Associate Professor of Laboratory Medicine and Pathology. 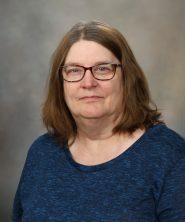 Lorraine Steele is a Clinical Laboratory Technologist in the Component Laboratory for Transfusion Medicine within the Department of Laboratory Medicine and Pathology at Mayo Clinic in Rochester, Minnesota. 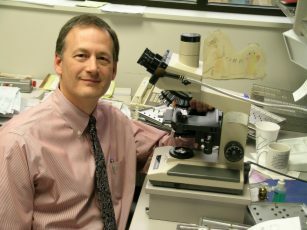 Hi, I’m Matt Binnicker, the Director of Clinical Virology and Vice Chair of Practice in the Department of Laboratory Medicine and Pathology at Mayo Clinic. In this month’s “Hot Topic,” a group of clinical laboratory technologists from Mayo Clinic’s Component Laboratory discusses a new tool to help standardize acceptable color variation for plasma products. I hope you enjoy this month’s Hot Topic, and I want to personally thank you for allowing Mayo Clinic the opportunity to be a partner in your patients’ health care. The topic for today is “Development of a Standardized Visual Inspection Aid for Plasma.” I am Lorraine Steele, a Clinical Laboratory Technologist within the Blood Component Processing Laboratory in the Division of Transfusion Medicine at Mayo Clinic in Rochester, Minnesota. Describe standardization of plasma-quality interpretation. Evaluate success of plasma-inspection aid. Whole blood is delivered to our laboratory by donor services. We receive blood from the main donor center as well as from off-site locations. After an initial inspection, product labels are applied to the bags, and the units are hung to filter. The filter removes platelets and white blood cells so that our blood products are leuko-reduced. Once the units have been filtered, they are centrifuged. The units are placed into a manual expresser, and the plasma is expressed into a separate bag. The red blood cell (or RBC) and plasma bags are separated, and a visual inspection is performed. The RBC units have tubing segments made; they are documented in the computer and then stored in the refrigerator. The plasma units are weighed, documented, and frozen. Product processing, from draw time through storage, must be completed within eight hours. When performing a visual inspection of plasma, several factors are considered. The primary one we will talk about is color. Plasma comes in a variety of colors. 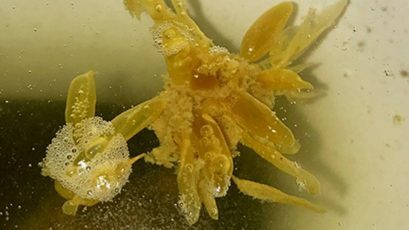 Most plasma will be yellow or “straw colored” like these two photos. Some will be various shades of orange to red. These three photos show light orange, darker orange, and red plasma. Orange- to red-colored plasma can be caused by hemolysis, but most often, it is RBC contamination. A green color, as seen in this photo, is often medication-related. The other most common thing we see that makes plasma unacceptable is lipemia, which is an indication of the presence of lipids in the blood. Lipemic plasma has a milky appearance. This photo shows three lipemic plasmas that are green, yellow, and orange in color. We also look for clots, contaminants, or problems with the bag that would make plasma unacceptable. Is there a standard for RBCs in plasma? What volume of RBCs is acceptable in plasma? What does plasma look like at different RBC concentrations? The next few slides will address these questions. The first thing that needed to be determined was whether there was already an established standard for RBCs in plasma. There is no regulatory standard at this time. The American Red Cross “Visual Inspection Reference Guide” shows a number of photos of plasma. There are photos of normal plasma, which is yellow as well as green-tinged. There are also photos of normal plasma with red cells that are shades of orange. It does not state whether the normal plasma with red cells is acceptable. There is no specific color or RBC concentration that defines a cutoff to determine whether plasma is acceptable. Therefore, with no standard available, more investigation was necessary to make an accurate determination. What volume of RBCs is acceptable in plasma? In order to answer this question, we looked for any recommendations available. The only source we found that mentions a limitation of RBCs in plasma is a specification of less than 4 x 106 RBCs/mL, which is necessary for the pathogen-reduction technology used for our platelets. This RBC concentration is based on the technology limitations and is not a patient-care recommendation. We decided to use this specification as a guideline to help us set a cutoff for determining acceptable versus unacceptable plasma. It may be possible that a higher RBC concentration would be acceptable to use for patients, but by adhering to this guideline for an FDA-approved process, we can be sure that our cutoff would qualify for patient use. In order to have a visual of what plasma looks like at various concentrations of RBCs, a demonstration was set up. Units selected were similar in size and color to make the comparison as uniform as possible. The plasma units were yellow in color and approximately 300 mL. RBCs were injected into the plasma units in incremental volumes ranging from 0.05 mL to 0.50 mL. The varying concentrations of RBCs were laid out and paired with non-injected control units. Each plasma unit was labeled with the RBC volume that was injected. I would like to note that most of these photos are not professionally taken, and the colors are not identical to the colors seen in the live units with the human eye. We also noticed that when putting the photos into presentations, they often lose some of the contrast. Techs are able to see subtle differences between orange- and red-tinged plasma that may not be as obvious in the photographs. We had multiple Component Laboratory techs and management members observe the test units. We wanted to get opinions from as many people as possible who routinely perform blood inspections in order to determine the most common visual cutoff. The visual cutoff consensus was determined to be between the 0.10 mL and the 0.15 mL injected plasma units. We then calculated how the visual cutoff matched with the guideline we previously established, which was less than 4 x 106 RBCs/mL. We used a figure of 5 x 109 RBCs/mL, which is based on whole blood with an average hematocrit of 45%. We doubled that for a unit of packed RBCs to determine the number of RBCs injected into the units. When 0.1 mL is injected into a 300 mL plasma unit, the concentration would be 3.3 x 106 RBCs/mL, which falls below our guideline of less than 4 x 106 RBCs/mL. This made the process smoother because the level that most people were already finding to be a good visual division between acceptable and unacceptable plasma worked out to be mathematically the best, so it did not require a lot of retraining on our part. Our next step was determining the best way to standardize blood inspection across multiple work units. Again, there is no regulatory standard for RBCs allowed in plasma. There is no visual inspection guide available that shows unacceptable limits for plasma. However, since blood is handled by several different areas between collection and transfusion, it was important to establish a level of consistency across multiple work units as to when plasma is acceptable versus unacceptable. The best way to do this would be to have a standardized visual-inspection aid for plasma that could take the guesswork out of making these decisions. The creation of a plasma-inspection aid turned out to be relatively simple. We had already given ourselves a good visual with our injected plasma units, which showed the variation in RBC concentration and its effect on the plasma color. A cutoff for “acceptable” versus “unacceptable” plasma was determined visually as well as mathematically using our pathogen-reduction technology guideline. The visual cutoff was effective whether observing fresh plasma or plasma that had been frozen and then thawed. We had professional photos taken of the samples to provide an easy-to-use visual-inspection aid. We created a double-sided card as our plasma-inspection aid. One side of the plasma-inspection aid shows the plasma bags so that techs can see the variation throughout the bag. The other side of the plasma-inspection aid has larger rectangles similar to a “paint chip” sample. These were created by taking close-up shots of the plasma in the thickest part of the bag so they would show the darkest color in the sample. Whenever there is a plasma unit that may be on the borderline of the cutoff, it is simple to lay the card next to the plasma bag or directly against the bag at the thickest, darkest area to help make the decision. Making sure that the plasma is on a light-colored surface or putting a white sheet of paper under the unit can help to see the color difference better. If the plasma is on a dark surface, it may appear to have a darker orange or red color. Any plasma that does not meet the cutoff is unacceptable. It should be discarded, or there is still the option to re-spin the plasma and try to clean it up so that it meets the acceptable level. Our plasma-inspection aid was implemented in May 2016. In August 2016, we also implemented a new process that removed our second spin of plasma. Having a standard visual cutoff made it easier for techs to determine whether to keep, discard, or further clean up plasma with a second spin. We were initially concerned that we might see an increase in the discard rate of plasma due to unacceptable color. Throughout this process, we were able to save plasma that might previously have been discarded because there wasn’t a clear-cut way to make decisions about borderline plasma. During the initial implementation period, we had a discard rate of 2% of plasma due to unacceptable color. After three months of the new process, our discard rate for color was down to 1%. Over the last year and a half, members of our original project team have had the opportunity to observe the use of the aid within our own Component Laboratory. The aids are placed in many areas around the lab and are very convenient to use. We have also seen techs use them on a regular basis. In the beginning, other techs would seek out members of the committee for input in using the guide. We are now seldom asked for opinions because the aid is so simple and easy to use. While reviewing our original process of developing the tool and surveying its use, we actually discovered that our cutoff plasma level has a lower concentration than we originally thought. When the calculations were done during the development stage, we doubled the concentration of RBCs in a whole-blood unit to obtain the starting number in a unit of packed RBCs. This was an estimate based on the fact that when plasma is removed, it is nearly half of the volume of the whole-blood unit. This did not take into account the fact that there is still some plasma left in the RBC, and an additive solution is also added to the RBC to extend its shelf life. With the concentration of an average 60% hematocrit RBC unit being 6.6 x 106 RBCs/mL, the concentration in our cutoff plasma was actually 2.2 x 106 RBCs/mL instead of the 3.3 x 106 RBCs/mL that we originally calculated. This means that if we want to stay within our guideline of less than 4 x 106 RBCs/mL, we could actually move our cutoff one level higher and produce an updated plasma-inspection aid. However, since the visual cutoff that we chose is widely accepted among techs producing the plasma and we haven’t had a significant increase in discarded plasma, we chose to leave our cutoff at the previously defined point. We recently conducted a survey of personnel in the Component Laboratory and the hospital blood banks who issue blood products for transfusion. We had responses from 56% of laboratory personnel. When asked if the respondents use the plasma-inspection aid, 84% of lab personnel indicated that they use it. Also, 87% of respondents believe it helps determine plasma acceptability. Personnel were also asked to comment on how the plasma-inspection aid has improved visual inspection. Of those responding, 92% expressed an opinion on ways that it has improved inspection. Of the remaining 8%, only one person felt that it has not improved visual inspection. As a whole, laboratory personnel surveyed described having more confidence in their blood-inspection decisions and said there have been fewer questions. 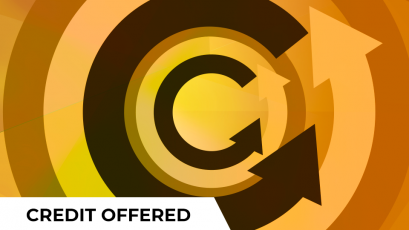 The terms consistency and standardization were frequently mentioned, which was exactly what we set out to achieve. Management commented that they are pleased to have a tool that is scientifically supported, clear-cut, and precise. Many also expressed appreciation for the tool, describing it as a great tool, a valuable tool, and a useful tool and saying they love it. We were thanked for creating it and are excited that others like it as well as we do. In this slide, you have a visual overview of the development of our plasma-inspection aid. The members of our original project team are also listed. Why we needed an aid—a standardized method of inspection. What needed to be determined—acceptable color and acceptable RBC concentration. The outcome—a visual and mathematical cutoff. Survey results to support the effectiveness of the aid. Looking back to the objectives for this presentation, we have explained whole-blood processing from blood delivery through final products. We defined color, lipemia, clots, contaminants, and bag issues as criteria used to evaluate plasma. We differentiated acceptable plasma quality, both visually based on color and mathematically. Standardization of plasma-quality interpretation was achieved by producing plasma units of known concentrations. The color of these units was used to establish a visual cutoff point for acceptable plasma, which was then verified mathematically. Based on these results, a plasma-inspection aid was created and implemented to provide standardized plasma inspection across multiple work units that handle the plasma for transfusion. We evaluated the success of the plasma-inspection aid through personal observation and a survey of laboratory personnel.